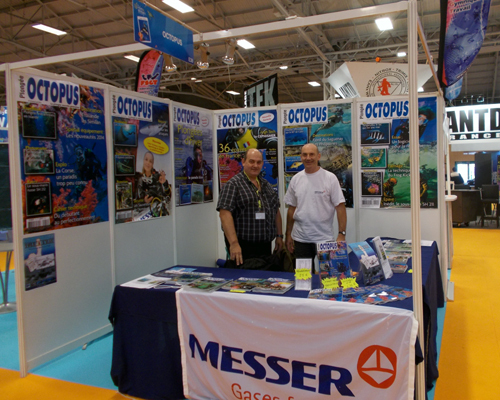 This year, the 16th edition of Paris International Dive Show opened its doors on Friday, January 10 for a period of three days during which enthusiasts divers and sea lovers were able to walk down the aisles and discover many hardware shops, travel agencies, the media and many companies or firms acting for scuba world. Fans of equipment could rejoice as one-third of the exhibitors were manufacturers and importers. The Marine nationale, the Gendarmerie and the Police were also present. As usual, many events were offered to the public, including scuba baptisms. Personalities were present as well as l’Expédition Scyllias which was hosted at the stand of Octopus magazine. A big thank to Paul Poivert, the friendly manager of the famous magazine for having supported us once again ! The Paris Dive Show was also an excellent opportunity for l’Expédition Scyllias team to establish fruitful contacts, particularly with foreign divers and equipment manufacturers, and to reckon on new projects. Beautiful and interesting adventures in perspective. 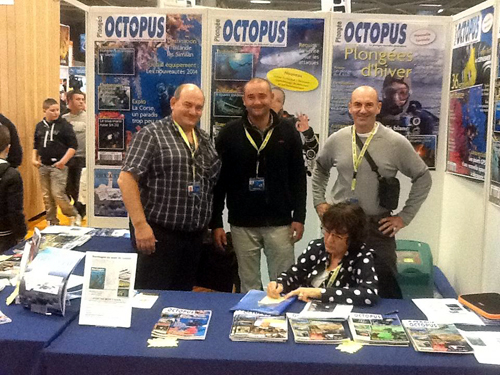 Selim BACCAR, an essential personality of the Tunisian diving came and said hello on the Octopus' stall hosted by Paul Poivert and Jean-Louis Maurette.